For over 40 years, Apple AM – Taunton hospital Radio has brought entertainment to the patients and staff of Musgrove Park Hospital. Once broadcasting from the back of an old ambulance, the station has come on leaps and bounds since it’s birth in 1971 and on Saturday May 11th, the proud and dedicated band of volunteers will usher in a new era as the station marks its transformation to Apple FM, which will be broadcast on 97.3FM throughout Taunton and the surrounding area. 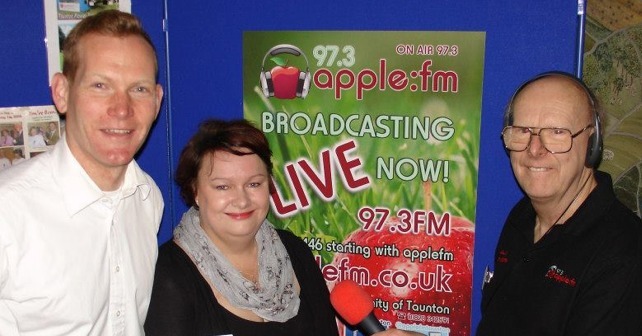 Apple FM chairman Jason Freeman said “This is great news for the Community of Taunton, who will be able to hear our diverse range of programming for the first time. We are constantly the number one choice within the hospital and hope to build on that success within the community. “We have a team of over 30 volunteer presenters, who put together 113 hours of Taunton based broadcasting each week something even a commercial radio station would be proud of and we are very excited about bringing diverse and truly local radio back to Taunton. “Moving forward we need the community of Taunton, to get involved so if you’ve got your finger on the pulse about what’s going on in and around the Taunton Deane area, then get in touch with us we’d love to hear from you. So, please do join us as we spread the word of your new community radio station 97.3 Apple FM launching on Saturday May 11th.